The first member of the Beeston Old Boys Association to make the Supreme Sacrifice during the Great War was Private Wilfred Frank Booth who was reported missing believed killed in action on Thursday 11th March 1915, the first day of the "Battle of Neuve Chapelle". 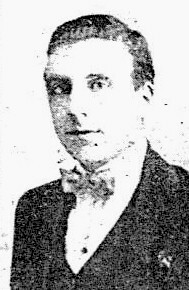 Born on the 10th February 1893, he was the fourth son of William & Elizabeth (née Hewitt) Booth of 59 Wollaton Road, Beeston2. The mother of twelve children - seven girls and five boys - Mrs. Booth brought many other children into the world, being the local midwife for the area. As well as bringing up such a large family, Elizabeth spent thirty two years in the nursing profession until she died at the age of sixty-six in 1925. Her husband William was to die five years later in 1930; both are buried in Wollaton Road Cemetery. Two other sons of William and Elizabeth, Percy William and Herbert served in the local Sherwood Foresters Regiment, the eldest boy Percy William who was born in 1884 was a sergeant in the 13th Battalion. Herbert born in 1890 was wounded in 1917 while serving with the 2nd Battalion. Daughter Mildred born in 1885 married Herbert Mayfield who served as a 2nd Lieutenant in the "Sherwoods". The couple later emigrated to Australia to start a new life out there. Daughter Sarah Amy who was baptised in 1888 also emigrated to Australia and married there. Daughter Ethel Mary, baptised in 1891 married Albert Lee who was killed during the "Somme" Battles in 1916. Another daughter Edith Annie who was baptised in 1894 married Arthur Johnson who was to be awarded the Distinguished Conduct Medal during the Great War. Older members of the Old Boys Association will remember Arthur and his wife at the "B B" camps after the Second World War. Wilfred Booth (shown above left and right in uniform) was educated at the Church Street School3. After leaving school at the age of thirteen, he worked as a card puncher for Mr. Whittle in his factory at Chilwell. One of the original members of the 17th Nottingham (Beeston) Company Boys Brigade when it was founded by Stephen Hetley Pearson in 1909, Wilfred was an active member both at the premises in the Anglo Scotian Mills Building and later at the Beeston Lads Club, when the company moved to Station Road in 1913. At the age of seventeen he joined the newly formed Beeston Old Boys Association who shared a room the Station Road Building. He was one of a party of pals who marched from the club to a Recruitment Centre in Nottingham with Captain Stephen Hetley Pearson in late August 1914. Most of this group enlisted in the Sherwood Foresters "Notts & Derby" Regiment. Private Booth enlisted in the local Sherwood Foresters Regiment where, after training, he joined the 1st Battalion on the 24th February 1915 and served in "A" Company, before being posted abroad.The 1st Battalion Sherwood Foresters had been stationed in Bombay at the start of the war. They had sailed from India on the 3rd September 1914 and landed at Plymouth on the 2nd October, later to join the 24th Brigade, 8th Division at Hursley Park near Winchester. The battalion landed at Le Havre on 5th November 1914. The Battle of Neuve Chapelle - Despite poor weather conditions, the early stages of the battle went extremely well for the British. The Royal Flying Corps quickly secured aerial dominance and set about bombarding German reserves and transportation (railways) en route to defend the area. By noon, Neuve Chapelle itself had been secured. It was at this point that the advance ground to a halt. Though the aerial photography had been useful to an extent, it was unable to efficiently identify the enemy's strong defensive points. Primitive communication also meant that British commanders had been unable to keep in touch with each other and the battle thus became uncoordinated and this, in turn, disrupted the supply lines. On 12 March, German forces launched a counter-attack which, although unsuccessful, did at least manage to end any chance of further advancement; the campaign was officially abandoned on 13 March. 40,000 Allied troops took part during the battle and of these 11,200 (7,000 British, 4,200 Indian) failed to return. The Germans lost around the same number. In total, the British succeeded in recapturing just over 2 km of lost ground. 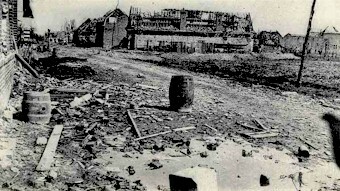 the picture shows a street in Neuve Chapelle after the battle. 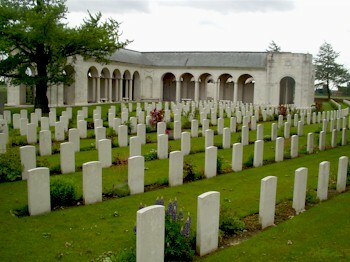 After the failure of the Battle of Neuve Chapelle, the British Commander-in-Chief, Field Marshal Sir John French, claimed that it failed due to a lack of shells. This led to the shell crisis of 1915 which brought down the Liberal Government under the premiership of H.H.Asquith. He formed a new coalition government dominated by Liberals and appointed Lloyd George as Minister of Munitions It was a recognition that the whole economy would have to be geared for war if the Allies were to prevail on the Western Front. Part of the response to the emergency was the opening of the National Shell Filling Factory in Chilwell, then a village to the south-west of Beeston. By the end of the War, it had filled and supplied over 19 million shells - about 50% of those fired during the war. 2At the time of the 1901 Census, the family was living at 13 Middleton Street, Beeston (Piece 3153 Folio 37). William Booth was working as a lace maker and was recorded as born in Beeston in about 1858; his wife Elizabeth (née Hewitt) was shown as born in about 1859 in Bramcote, Notts. 3He is recorded as schoolboy No 1633 in the school Admission Register.